Munich, August 9, 2002: Crossing the final yards with a burst of speed, Francis Obikwelu, a naturalized Portuguese citizen born in Nigeria, takes second place in the 200-meter race of the 24th European Championships. It is only the second silver medal for Portugal in such games, and the best-ever result for a Portuguese athlete in short distance races. With his citizenship in Portugal and his affection for Nigeria, where he is still a frequent visitor, Obikwelu exemplifies new paths of shared identity and global circulation. More importantly, however, his story mirrors the larger picture of Portugal's increasingly diverse immigration flows, regional spread of settlement patterns, and rising immigrant skill levels. Portugal, long a country of seafarers and emigrants, has in many ways become a country of immigration. But in reality, no simple characterization fits perfectly. Although net migration in the 1990s was positive, the meaning of migration for Portugal cannot be measured by simply adding up columns of figures. In fact, Portugal and its authorities have progressively developed an expansive view of migration supported by links with the longstanding Portuguese diaspora. Portugal's Ministry of Foreign Affairs has registered and attempts to maintain ties with nearly 4.3 million Portuguese and people with Portuguese ancestry living abroad. This outnumbers by a factor of 10 the number of foreigners and those with foreign ancestry living in Portugal. Members of Portugal's diaspora community have maintained tight relations with their homeland in the form of frequent visits, regular sending of remittances (approximately three percent of GDP in 2000), faithful viewing of Portuguese television programs, significant participation in civil society associations and parliamentary elections, and consumption of "ethnic" goods. Beyond this, Portugal has always had a special relationship with its former colonies. Brazil, along with the association of Portuguese-Speaking African Countries (PALOP) that includes Angola, Mozambique, Guinea-Bissau, São Tomé and Principe, have played a prominent role in Portugal's migration history. Immigrants from PALOP states have recently been joined, however, by arrivals from non-traditional source countries. Portugal continues to balance these two forces: on the one hand, an enormous diaspora that maintains close social, economic, and cultural ties with Portugal, and on the other, immigrant flows from former colonies that continue to benefit from some legal preferences (e.g. the demand for a shorter period of continuous residence in Portugal in order to request Portuguese citizenship), despite growing diversification. The combination of these emigrant loyalties with recent immigration paints the full picture of Portugal in the global migration system. Emigration from Portugal dates from the 15th century, the beginning of Portugal's period of overseas exploration. From the middle of the 19th century to the late 1950s, nearly two million Portuguese left Europe to live in Brazil and the United States. In the late 1950s, Portuguese emigration started to increase and follow labor market demands toward new destinations in the expanding economies of Northern and Central Europe, particularly France. In the next 15 years, up until 1974, more than 1.5 million Portuguese emigrated to take up jobs in low-wage, low-productivity sectors. Some Portuguese also fled the country's right-wing dictatorial regime that lasted between 1926 and 1974. Portuguese emigration slowed in the mid-1970s due to two factors. The first was an economic crisis in Europe's major economies that led them to close their doors to foreigners in 1973. The second factor was the Portuguese Revolution in April 1974, which brought down the dictatorship and saw the return of many Portuguese exiles. Portuguese emigration did not come to an end at this time, and even increased in the late 1980s and early 1990s, soon after Portugal joined the European Union in 1986. By the early 1990s, however, when Portugal was able to reap the advantages of the EU's free movement policies, there was a reduction in flows, as well as new emigration characteristics: an increase in the proportion of females, rising skill levels, and the dominance of temporary migration to other EU member states. The presence of foreigners -- particularly in Lisbon -- was obvious as early as the late 15th century. Because of its geographic location, the country attracted adventurers and merchants from England, Dutch provinces, regions of Spain, and Italian cities. Against their will, thousands of African slaves arrived as well. In the first half of the 16th century, Lisbon was the European capital with the largest proportion of African residents, an estimated 10 percent of the 100,000 inhabitants. After the middle of the 17th century, Lisbon started to lose the stature of an international metropolis, and saw its cosmopolitan profile eroded. In the late 18th century and 19th century, the only significant emigration flow came from the neighbouring Spanish region of Galicia. This relative lull was to last until the 1960s, when Portugal once again began experiencing important immigrant flows. Portugal's immigration lull ended in the 1960s, and the mid-1970s and the 1990s saw a strong upswing in arrivals. Political and economic factors alike lay behind this revival of the country's historic role as a magnet for visitors, whose goals ranged from securing temporary work to settling permanently on Portuguese soil. As early as the second half of the 1960s, Portugal registered the first arrival of African workers from its colonies. Cape Verdeans were recruited for construction and manufacturing jobs to fill a growing labor shortage associated with emigration and the channelling of Portuguese men into colonial wars. Alongside these Africans were Europeans from countries such as Spain and the United Kingdom, most of them retired and highly skilled professionals from wealthy families, who were profiting from the opening of the Portuguese market by working in foreign firms. The strong revival of Portugal's migration streams, however, began in the 1970s with an explosion of immigration spurred mainly by the process of decolonization and subsequent political and military instability in the PALOP states. This immigration stemmed from social reshuffling in the wake of the Portuguese political retreat rather potential pull factors (e.g., economic growth or progressive political changes) in Portugal itself. In the mid-1970s, the decolonization of former Portuguese possessions such as Mozambique, Angola, and Guinea-Bisseau led to a sudden movement of more than half a million people to Portugal, in particular to the Lisbon area. The majority of these were "retornados" and their descendants; that is, people born in Portugal and/or their children or grandchildren. Alongside the retornados came Africans, especially from Cape Verde and Angola. These groups were responsible for an explosion in the number of foreigners in Portugal, and for the establishment of the main migratory chains. Another key outcome of the decolonization process was important changes in the laws that determined the access to Portuguese citizenship of Africans born in the PALOP states. These changes denied automatic Portuguese citizenship to those who were born in the African colonies whose parents, grandparents, or great-grandparents had not been born in Portugal, or who until the 1974 revolution had not been living for more than five years in Portugal. Only Africans in a few exceptional situations (e.g., veterans of the Portuguese colonial army or administration) could overcome these restrictions and successfully apply for Portuguese citizenship. A new migration cycle emerged from the mid-1980s to the late 1990s, driven to a large degree by Portugal's increasing demand for labor. Joining the European Union in 1986 made Portugal a more attractive destination for non-EU citizens trying to settle in other countries of Northern and Central Europe. 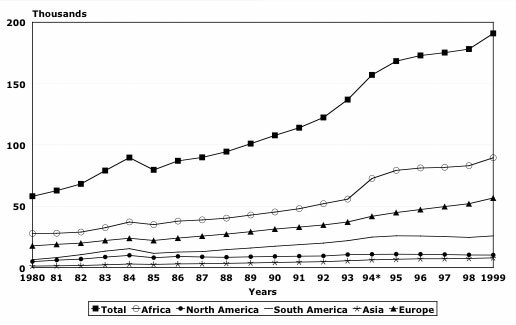 The result was a continuous increase in the number of foreign residents, dominated by Africans and, to a lesser extent, Brazilians and Western Europeans (Figure 1 and Table 1). Note: The statistics for 1994 include the special regularization process (1992/93). Source: Fonseca, M., M.J. Caldeira, and A. Esteves (2002), "New forms of migration into the European south: Challenges for citizenship and Governance -- the Portuguese Case." International Journal of Population Geography, 8(2): 135-152. The new cycle was marked by a subtle but increasing trend towards diversity. The origins of people arriving in Portugal from overseas became more varied, as the relative proportion of those born in the five PALOP states declined from 45 percent in 1981 to 40 percent in 1991. In the same period, the share of Cape Verdeans (the largest immigrant group in Portugal) decreased from 39 percent to 26 percent, and to only 22 percent in 2001. Meanwhile, more migrants arrived from Brazil, the Democratic Republic of the Congo, Senegal, China, and India, as well as from other parts of Europe. The new group of migrants differed from previous ones in terms of its complex makeup of nationalities and occupations. The new arrivals mainly fell into three categories. First, there were low-skilled workers from sub-Saharan Africa, especially PALOP states, who mainly took jobs in construction (men) and domestic/industrial cleaning (women). Second, there were professionals coming from Western Europe, and to a lesser extent the United States. Finally, there were Brazilians, a group initially dominated by high-skilled professionals such as dental surgeons, marketing personnel, IT experts, and journalists, but which also came to include semi and low-skilled workers in the commerce, hospitality, and construction sectors. In the late 1970s and early 1980s, Portugal's number of asylum applications reached a first peak (approximately 1,600 in 1980, when the first asylum law was published). This peak is associated with civil wars and political persecution in Angola and Mozambique. Between 1992 and 1994, a second peak (1,659 in 1993) was reached with the arrival of Eastern Europeans claiming persecution in their region. Most of their applications were turn down, and the asylum legislation was made more restrictive. Since then, the origins of asylum seekers have become more diverse; West Africans have recently been replaced by arrivals from Eastern Europe and Central Asia. The number of asylum seekers has stabilized at very low levels (an average of approximately 260 applications per year between 1995 and 2001), making Portugal the EU country with the lowest number of asylum requests. The asylum law was altered again in 1998, expanding the scope of the situations of protection and offering the possibility of employment provided that applicants held a provisional residence permit. The new law also recognized the Portuguese Council for Refugees (CPR) as a key institution in the juridical support of asylum seekers, as well as the role of the shelter institution in the process of receiving such people in Portugal. The number of asylum claimants who obtain refugee status under the 1951 United Nations Convention Relating to the Status of Refugees and its 1967 Protocol Relating to the Status of Refugees, or who receive a residence permit on humanitarian grounds, is quite low. Between 1998 and 2001, only approximately 20 percent of all requests were granted in either of these ways. Note: The above table does not include data on "permanence" permits issued in 2001 to foreigners who entered Portugal illegally but were able to register their work contracts (see Table 2). PALOP is an acronym for "Paises Africanos de Lingua Oficial Portuguesa," or "African Countries with Portuguese as the Official Language." Source: Serviço de Estrangeiros e Fronteiras, 1999, 2000, and 2001. Since the end of the 1990s, yet another phase in Portugal's immigration history has been underway, this one marked by the arrival of thousands of mostly undocumented immigrants from Eastern Europe, particularly Ukraine, Russia, Moldova, and Romania. In a mere five years, Ukrainians have become the third-largest group of foreigners, immediately after Cape Verdeans and Brazilians (Table 2). The shift from earlier migration cycles has been a complex one. The networks that shaped immigration from the PALOP states and Brazil have been joined by two other factors. First, for many Eastern Europeans, traffickers and "professional immigration agencies" have replaced the geographic proximity, migrant networks, and cultural links associated with a colonial past that have traditionally spurred immigration. Second, although the job loss and wage cuts associated with the political and economic transition in Eastern Europe pushed many people to migrate, the needs of Portuguese employers have played a significant role in the recruitment process of these newcomers. Being a country with a low level of unemployment (4.2 percent in 1999, when the EU average was approximately nine percent), expanding consumption, and a significant investment in the renewal of basic infrastructure such as roads and dams, the need for foreign labor is acutely felt. This is particularly true of sectors like construction, manufacturing, cleaning, and retail sales. Portugal's hunger for foreign workers was graphically illustrated by the labor market's incorporation of approximately 125,000 immigrants with valid work permits who were able to legalize their status through "permanence" permits between January and November 2001. Most of the foreigners who legalized their status under this arrangement came from Eastern Europe (namely Ukraine, Moldova, Romania, and Russia) and had arrived recently in Portugal. In yet another break from previous cycles, the Eastern European migrants display relatively high levels of education (secondary and college degrees, frequently in technical domains) and are spread throughout the country. While migrants who dominated previous cycles, namely the arrivals from the PALOP states, were highly concentrated in the Lisbon area, the immigrants who legalized their status show higher dispersal levels throughout the country. This settlement pattern reflects the needs of regional labor markets in certain areas of high expansion, particularly those that have benefited from public investment in physical infrastructure projects in Oporto and its surroundings, the northern extensions of the Lisbon metropolitan area, and some middle-size cities such as Coimbra, Leiria, and Évora. In addition, certain economic activities such as agribusiness and labor-intensive industry have relied heavily on inexpensive foreign labor. -- Value too low to be included in the data published by the National Statistical Institute (INE). PALOP is an acronym for "Paises Africanos de Lingua Oficial Portuguesa," or "African Countries with Portuguese as the Official Language." National Statistical Institute (INE, 2001) Demographic Yearbook and ACIME/SEF/IGT (2002) Relatório sobre a Evolução do Fenómeno Migratório. Lisbon, ACIME/Serviço de Estrangeiros e Fronteiras/Inspecção Geral do Trabalho, Março de 2002. The year 2002 finds Portugal, after the sharply increased inflows of the previous three years, with a group of migrants who are more diverse than ever in terms of national origins and settlement patterns. The 350,000 registered foreigners now correspond to approximately 3.4 percent of the total population. This figure excludes the foreign born who have obtained Portuguese nationality. The Portuguese policies designed to manage this situation, as well as ensure future social and economic stability, have several important foundations. Most importantly, the Portuguese Constitution grants certain basic rights to immigrants and foreigners, with the exception of some political rights and state functions. The Constitution also gives foreigners from Portuguese-speaking countries certain advantages in matters related to the attainment of some social and political rights. This preferential treatment for natives of Portuguese-speaking countries is also reflected in some aspects of the country's legal code. Portugal's first steps in terms of immigration policy were set forth in the early 1990s as a result of various domestic and external factors. These included the growth of the foreign population, the consciousness of an increasing presence of undocumented immigrants, the visibility of social problems facing people of African descent such as unemployment and poor housing, and advocacy by non-governmental organizations (NGOs) and immigrant associations to defend immigrant rights and demand a more proactive attitude on the part of the government and civil society. Additionally, policy in the 1990s was shaped by Portugal's membership in the European Union, including pressures on all member states to strengthen border controls and tighten immigration rules. The elements of Portugal's migration policy and its legal underpinnings saw important developments at the beginning of the 1990s, particularly with the legalization of undocumented immigrants. Prior to the enactment of new immigration laws in 1993 and 1994 designed to restrict inflows and harmonize with EU norms, the government implemented a process of extraordinary regularization. Approximately 40,000 undocumented foreigners legalized their status under the program, thereby obtaining civil rights. A second program of this type, in 1996, saw 35,000 undocumented immigrants (67 percent of them from the PALOP states) apply for ordinary residence permits. Also in the early 1990s, largely as a result of pressures from NGOs and immigrant organizations, the government responded with several important measures, including the 1991 creation of a Ministry of Education secretariat to promote the development of multicultural education at the elementary and secondary school levels. Other important steps in direction of equal rights followed in the fields of labor, social security, and housing. After 1995, the framework of integration policies was further developed, widening the goals and initiatives of previous years and recognizing the need for a specific government body to address immigrant and ethnic minority issues. The result was the 1996 creation of a coordinating body for different integration activities, the High Commissioner for Immigration and Ethnic Minorities (ACIME), and the 1998 establishment of the Consultative Council for Immigration Affairs (COCAI). Under ACIME chairmanship, the council convenes representatives of the recognized immigrant associations, NGOs, organizations of entrepreneurs, major trade unions, and the State Secretary for Portuguese Communities of the Ministry of Foreign Affairs. Meanwhile, several steps have been taken to eliminate the inequality and discrimination faced by foreigners. Besides the extension of civil rights under the two extraordinary regularization programs, the scope of the housing program has been enlarged, a Guaranteed Minimum Social Income for people and families in need has been established and has incorporated poor foreign households, the law regulating work by foreigners has been loosened, and foreign citizens have been given the opportunity to vote in Portuguese local elections (assuming a reciprocal arrangement with their country of origin). Similarly, local municipalities have responded, especially the Lisbon Metropolitan Area. Initiatives such as the local-level campaign for regularization, the Special Re-housing Program, and the Intercultural Education Program are examples of top-down initiatives that have contributed to the development of new municipal approaches to the issues facing ethnic minorities and immigrants. Some local authorities, in fact, have gone deeper than the government in their recognition of ethnic minorities as institutional partners. Besides steps in the field of culture (ethnic festivals, promotion of cultural and sports associations as well as music and dance groups), Lisbon and Amadora in 1993 and 1995 created consultative councils of immigrants and ethnic minorities that integrate representatives of locally recognised associations. In the period 1999-2000, the immigration issue has gained prominence due to several factors, including concerns expressed by employers about the shortage of domestic labor, the changing characteristics of the immigrant population, and the noticeable presence of many undocumented workers smuggled into the country by trafficking networks. The overall effect has been to spur a series of concrete actions, such as the temporary introduction of the "permanence" permits that allowed undocumented people with work permits to regularize their status and remain in the country for up to four years. The same legislative changes introduced a new element in foreign worker recruitment — a mandatory annual government report estimating the number of foreign workers needed in various occupations that year. Such changes in policy were rounded out with the tightening of bilateral ties where needed to streamline migration flows, such as the signing of immigration agreements with Bulgaria and Romania. Furthermore, in an attempt to ensure that momentum from previous measures and decisions is not lost, the new ACIME has recently begun to work on a National Plan for Immigration. The three pillars of the plan are improving the information available to immigrants through the creation of a national system of immigration support, increasing the availability of public services to immigrants, and supporting research that may improve the understanding of the situation of immigrants and ethnic minorities. In the medium term, Portugal appears likely to maintain its status as a country of immigrants, where inflows of migrants clearly exceed outflows. However, several question marks still hover on the horizon. First, the present trend of falling outflows may change as a result of recession, rising unemployment, and increasing economic competition within the EU, which will increase in size with the addition of several less developed states in 2004. Along with this will come a drop in EU funds channelled into Portugal, with additional economic consequences. In this context, existing Portuguese emigration networks may be activated, especially given that the free circulation of people within the EU facilitates temporary migration and coming-and-going strategies. The ongoing policy of reinforcing links with the Portuguese diaspora worldwide, which is expected to continue, will also likely facilitate further outflows. Second, the rapid increase in the number of foreigners registered between 1999 and 2001 will certainly slow. On the one hand, news about the reduction of opportunities in the Portuguese labor market is starting to spread. On the other hand, the current immigration framework that has sought immigrants is being replaced by more restrictive trends, supported by a new tone in political discourse that has begun to incorporate the word "deportation," and also by policy measures like the suspension of the "permanence" permits scheme in November 2001. Third, the present economic difficulties may cause some distress among the main immigrant groups, e.g., those from the PALOP states, Brazilians, and Eastern Europeans. Changes in Portugal's economy are having a particularly strong impact on Eastern Europeans, especially in terms of the supposed temporary character of this immigration, the consolidation of regional settlement patterns, the tapping of immigrants' skills for economic modernization and restructuring, and patterns of labor market integration. Taken together, recent actions indicate an effort by the Portuguese authorities to better regulate the flows and to implement a more flexible migration policy in the spirit of various European Commission documents. However, regulating immigration flows is a very complex task that requires cooperation among neighboring countries (in this case, the EU nations, which are likely to transfer migration policy from national institutions to EU bodies), as well as with countries of origin such as the PALOP states. In addition, recent international developments such as the September 11 attacks in the United States and symptoms of a global economic downturn, along with domestic events including rising unemployment, a change of government, and stagnant consumption and investment, all raise doubts about Portugal's ability to keep on the course it has chosen. Going forward will depend on the regulatory framework established by Portugal. Critics of current government policy point to the need to extend Portuguese citizenship to children with foreign parents who are born in Portugal. They also argue for the need to further extend certain rights of foreign nationals, for example allowing them to vote in local elections regardless of whether these nationals' home country extends similar rights to Portuguese nationals living there. The government is currently preparing additional changes to the laws pertaining to foreigners. If these changes do not disrupt family reunification processes now underway, refrain from differentiating between people in possession of residence and "permanence" permits, and do not facilitate deportation procedures, there will be a clear continuity with earlier migration policy. Recent political discourse and practice, however, seem to point to a more restrictive policy, one which may stress inequality among different groups of immigrants and foreshadow the narrowing of their opportunities. ACIME/SEF/IGT. 2002. Relatório sobre a Evolução do fenómeno Migratório. Lisbon, ACIME/Serviço de Estrangeiros e Fronteiras/Inspecção Geral do Trabalho, Março de 2002. Baganha, M.I. and Góis, P. 1998/1999. "Migrações Internacionais de e para Portugal: o que sabemos e para onde vamos?" Revista Crítica de Ciências Sociais, no. 52-53, pp.229-280, Coimbra. Baganha, M.I. and Marques, J.C. 2001. Imigração e Política: o caso português. Lisbon, Luso-American Foundation. Charbit, Y.; Hily, M.-A. and Poinard, M. 1997. Le Va-et-Vient Identitaire. Migrants portugais et villages d'origine. Paris, INED/PUF diffusion. Fonseca, M.; Caldeira, M.J. and Esteves, A. 2002. "New Forms of Migration into the European South: Challenges for Citizenship and Governance - the Portuguese Case". International Journal of Population Geography, vol. 8, n.2, pp. 135-152. Godinho, V.M. 1978. "L'émigration portugaise (XV-XXéme siècles). Une constante structurale et les réponses aux changements du monde" Revista de História Económica e Social, 1, pp. 5-32. Malheiros, J., André, I. and Possidónio, D. (coord.) 2002. Study for the diagnosis and evaluation of the reception process for asylum seekers in Portugal. Lisbon, Portuguese Council for Refugees (CPR)/Geoideia.